Mission – The Kirtland Air Force Base Honor Guard performs in over 500 ceremonies yearly. Our primary duty is to provide unfaltering, dignified military funeral honors for Airmen that have served their country with honor. Additionally, the Honor Guard is responsible for supporting many other special events such as memorials, military retirements, change of commands, award banquets, weddings, and various civic events. Requesting Services – Instructions for funeral and non-funeral ceremonies are under downloads. Please use the appropriate forms. If you do not have PureEdge Viewer 6.5 (downloadable from the web), you will have to use the PDF version of the Honor Guard Checklist, then fax your request. If you have PureEdge Viewer, you can use the electronic version of the Honor Guard Checklist and e-mail your request. Requests may be e-mailed to jennie.brown@us.af.mil or they may be faxed to 505-846-8390 or 505*-853-6791. How to Join – As a ceremonial guardsman, Airmen are placed on a six month tour and are assigned solely to the honor guard. Training classes are conducted every three months and we are always looking for highly motivated professionals. E-1s to E-6s typically perform this duty, but all ranks are encouraged to apply. Training class dates and frequently asked questions can be found under downloads to the right. 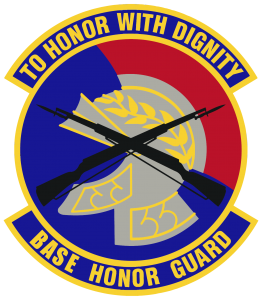 To experience satisfaction and esprit de corps as part of this distinguished team, contact the base honor guard at: jennie.brown@us.af.mil or call 505-846-8390 or 505-853-6791.
request to 505-853-2639. Please ensure you follow-up to confirm receipt and scheduling of your requested event. I can be personally reached at 509-879-5000.